I'm going to tell you something that happened the other night that is completely out of character for me. Are you ready? I did not finish the bottle of wine. I know, super crazy! I'm not quite yet willing to admit my age is catching up with me; instead, lets focus on the positive effects of that action. Should you find yourself in a situation where there is little wine left over, turn it into a quick dip and then remind yourself there is no shame in not finishing the full bottle. Plus, if you put a Fat and Happy spin on that - once you finish the dip, you will have essentially finished the bottle. Tips and techniques: If you like a creamier, runnier dip, add 1 tablespoon of milk or cream. The recipe below fits into about a 1 cup ramekin. Double or triple the recipe for a larger party. 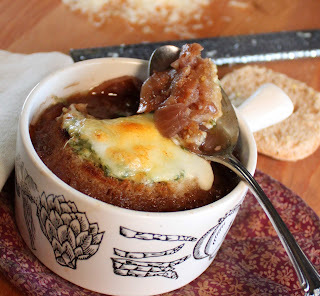 Using a fork, mash together the blue cheese, the cream cheese, the red wine and a few turns of black pepper leaving it a little chunky rather than completely smooth to give the dip a little texture. 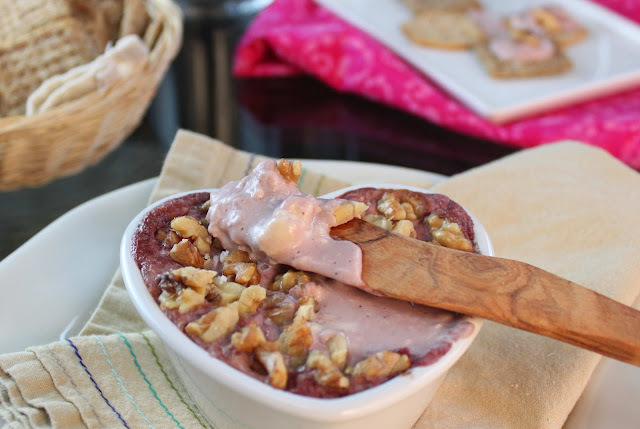 Place in a oven-proof ramekin or serving bowl and crush the walnuts on top. Bake about 15 minutes or until the dip is hot and bubbly. Remove from oven and serve with crackers. It's the middle of winter but I have a hankering for warm roasted tomatoes, yet something more than just salsa. It's not the best time of year to cook with fresh garden ingredients but if you have a produce store you can trust, go for it. Plus the roasting will help bring out deep, sweet flavors of the winter fruit. The way I create this soup follows similar principles of making a roasted salsa which starts by roasting the fruit/veggies and then blending them; the addition of chicken broth to the blended 'salsa' creates the soup. The result is a spicy, roasted flavor that is slightly cooled by the queso fresco (cheese) and the toasted corn tortillas. 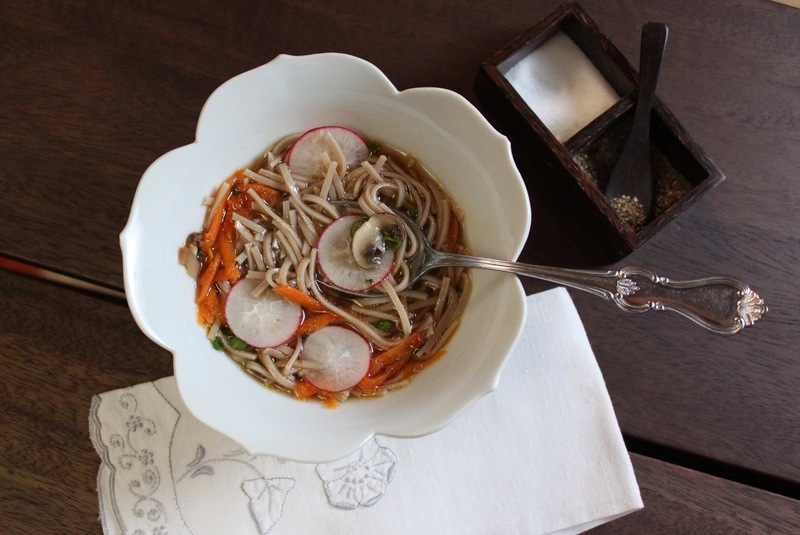 Another super simple, warm soup that gives you a healthy option over heavy cream and calorie laden soups - that's something to be Fat and Happy about. Tips and techniques: Mix and match the peppers you put in this soup for more more or less heat. Turn the oven broiler to high and line a cookie sheet with tin foil. Place the tomatoes, peppers, onions and garlic on the cookie sheet and place under the broiler. Let each side become nearly blackened and then turn. Take the garlic (and the dried pasilla chili if using) out first as it will only take a few minutes before it burns. Remove everything from the broiler and let cool slightly. Peel the garlic, (remove seeds and veins from the pasilla/jalapeno if using) cut the stem off the peppers and add all the roasted items to the blender. Add one torn up tortilla. Blend until smooth (if you want a chunkier soup, pulse the ingredients until desired thickness is reached.) Pour the salsa into a soup pot over Medium heat. Add the broth, salt and pepper to the pot. Simmer for about 20 minutes. In the meantime, place the remaining tortillas in a heated oven until crispy. Mash the avocado, lime juice and a few shakes of hot sauce together with a fork. To serve, add soup to bowls and top with a scoop of avocado, crumbled queso fresco and a few strips of corn tortilla. Makes 4 large bowls of soup. I don't claim to know North Carolina BBQ sauce, but I like it. This vinegar sauce is fashioned after that, but stops short of a tomato (ketchup) base. The tartness of the vinegar is soothed by the creaminess of the blue cheese. On it's own, the vinegar sauce packs a serious wallop, don't judge the sauce until it's paired with the meat, though. And if you've haven't married caraway with blue cheese before - you are in for a treat! Remember, I'm not in any way saying this is a true North Carolina sauce so remember that before you write in your comments lambasting me on this. 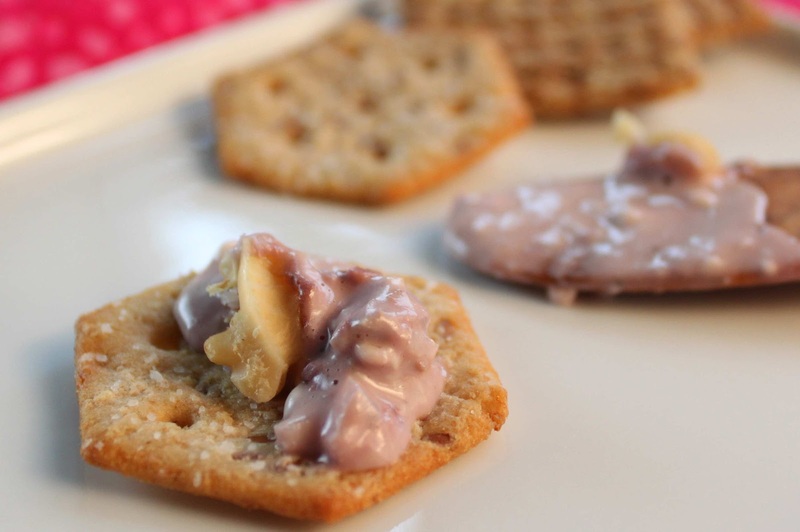 The combination of the vinegar, blue cheese and caraway seeds creates a super playful fun mixture on your palette. It's simple Fat and Happy sandwiches that rocks. Tips and techniques: Recipe makes 2 -4 sandwiches depending on the size of the naan. 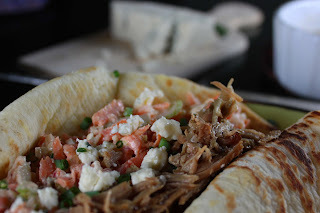 For the pork, see my posting for a classic crock pot pork. Putting it all together: Warm the naan bread by wrapping in tin foil and placing in a 300 degree oven. Place the pork in an oven-proof dish and cover with the vinegar sauce, place in the oven next to the bread for about 15 minutes. Remove the warmed bread and pork from the oven. 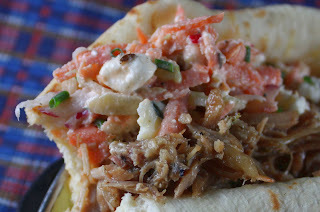 On the naan bread, layer on 1 cup of pork with a drizzle of the vinegar sauce and a few scoops of the carrot blue slaw. Fold the naan bread over, enjoy immediately. In a small sauce pan, heat all the ingredients over medium heat until the sugar is dissolved. Use immediately or store in the fridge for later use. 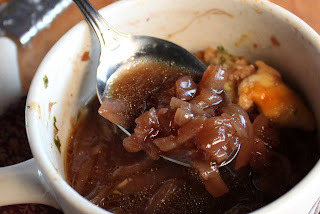 Pour over the shredded pork, allow the pork to sit in the the vinegar sauce to pick up the flavor. Using a box grater, shred the carrots, celery and radishes, place in a bowl. Add the yogurt, caraway seeds and a good pinch of salt and pepper. Stir to combine. Sprinkle the blue cheese over the top. 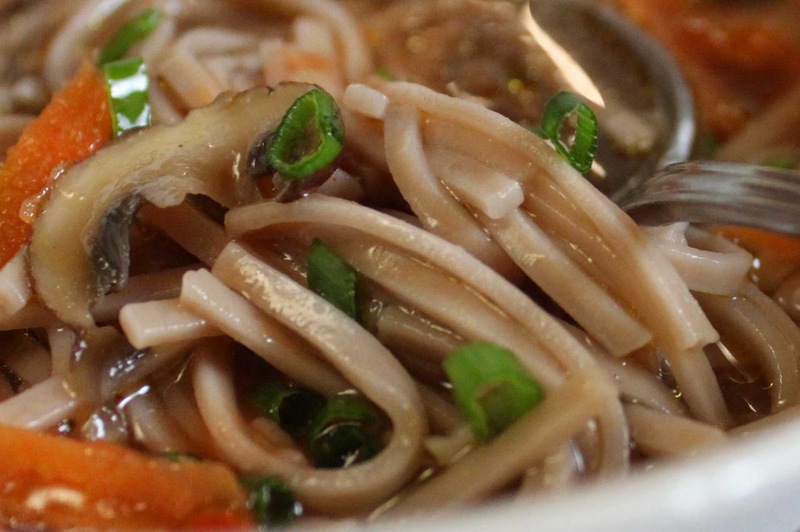 Stews come in all forms from turkey to lentil to fish. 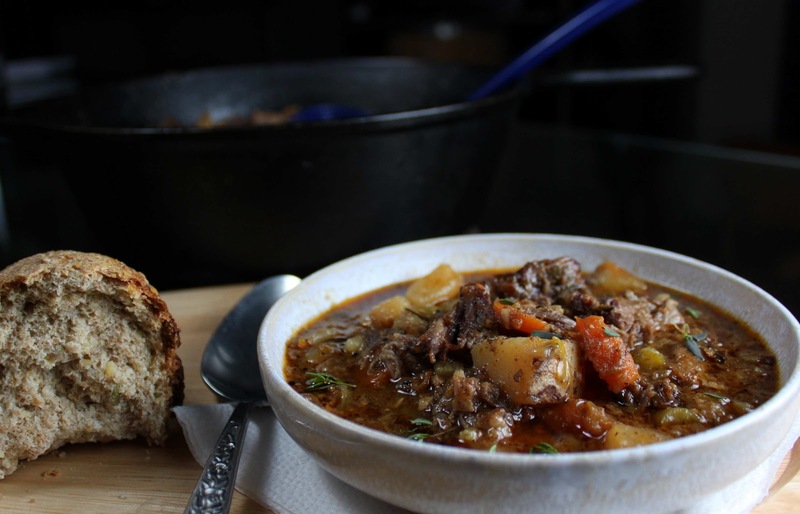 This oxtail stew plays off the classic beef stew tradition of browning the meat and simmering veggies, beer and broth for hours until all is tender, but I substitute in oxtail and chorizo just for fun. The oxtail has a slightly wild or game-y flavor compared to beef but it reacts the same when stewed for hours - fall off the bone deliciousness. 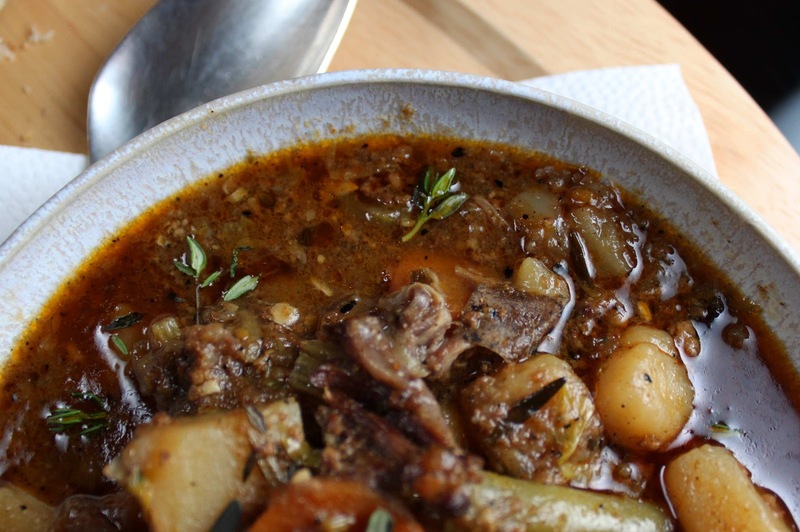 Fat and Happy comes in many forms, in this case a hearty warm stew for the cold February days. Enjoy! Tips and Techniques: I cooked this in a cast iron pot on the stove but you could easily drop all the ingredients into a crock pot and let it simmer all day. The oxtail bone may look like it doesn't have enough meat on it, but you'll be surprised how much meat will come off it in the end. Start by heavily seasoning the meat on all sides with seasoning salt and pepper, then brown the oxtail on all sides; remove from the pan and set aside. Add the chorizo to the pan, cook through and set aside with the oxtail. Remove the grease from the pan. Add the onions, carrot and celery to the pot, cook over medium high heat for about 5 minutes. Add in the garlic and potato, continue to cook (stirring often) to soften the garlic, about another 3-5 minutes. If the pan is getting too dry add in a tiny drizzle of olive oil. Deglaze the pan by pouring in 1 cup of broth, use a wooden spoon to scrap up any bits from the bottom of the pan. Place the oxtail and the chorizo back into the pot, now add in the beer, then add enough broth to cover all the veggies and meat. Cover the pan and let the stew simmer for 4-6 hours, you can also put this in the oven rather than on the stove top. Test the meat, does it fall off the bone? If so, it's ready. Remove the bones and carefully peel off the meat into chucks, place the meat back in the stew. Simmer the stew with the lid off for 20 minutes to thicken the stew; add in the green beans during the last 5 or 10 minutes of cooking so they retain a little crunchy rather than turn mushy. Taste for seasoning, add in more salt and pepper as needed. Add fresh thyme to each bowl before serving. Valentines Day, many people shudder just at reading the words, much less speaking them. To me, it's overrated and an unfortunate way to have to tell someone you love them ... because you should be doing this every day, right? Buying someone a dozen roses is the lamest excuse for a Valentines gift. Seriously, why would you listen to money-motivated companies telling you to buy inflated roses as your means of expression? If you really loved this person, you would put some thought into it. Or how about giving them a dozen roses in say, September just because you love them, not because a commercially exploited holiday says you should. All that said, I'm pretty sure I wouldn't turn down a dozen roses, should they be offered! Cookies are a simple solution. If you are in a happy relationship- forego the 'broken' and just give chocolate love. For those of you who definitely are NOT expecting a rose bouquet this year- why not have fun with this holiday. Let these cute, delectable chocolate black pepper cookies show your expressions for you. Complete with broken hearts, they are a conversation starter and if nothing else, will keep your cube-mates Fat and Happy. Try them with a glass of red wine, it really brings the black pepper to life! Tips and techniques: If you do not want to roll and cut out the cookies, simply form the dough into a log and roll in the sugar topping before wrapping in plastic wrap and refrigerating. Then take the log out and just slice into little circles. The original cookie recipe came to me via my parents some years ago; I've recently found out this was a Martha Stewart recipe. 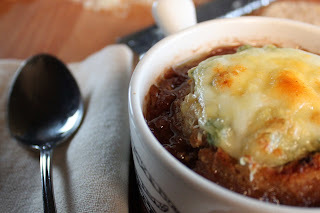 I made a few slight modifications by adding more pepper and also additions to the sugar topping, but props to Martha for sharing with all of us. Sift together the flour, cocoa powder, salt, pepper, ground coffee and the cinnamon; set aside. Cream the butter and sugar, add in the egg and vanilla. Slowly add in the flour mixture, blend on medium until everything is combined. Tightly wrap the dough in plastic wrap, place in the fridge for at least 1 hour. Make the topping by placing the sugar in a Cuisinart or blender, blend on high for a minute, this is to reduce the crystal size. Mix the sugar with the finely ground coffee beans and a pinch of cinnamon. Remove from the fridge and cut into four sections. Working quickly with one section at a time, roll the dough out to desired thickness. Sprinkle flour under the dough as it is sticky and will get stuck to the surface. I like this cookie best thin and crispy so I roll the dough out to around 1/8". Try a couple and see what you like best. 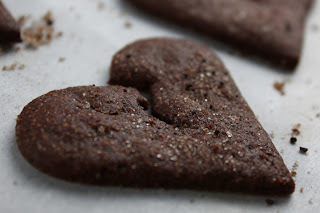 Use a heart cookie cutter to cut out as many hearts as you can; place them on a lightly greased cookie sheet. Take a pairing knife and cut little rips in the heart. Or lightly hold the heart and just rip it. Sprinkle each cookie with a little of the sugar topping. Bake at 375 degrees for 10 minutes. Cool on a cookie rack. Last night there was thundersleet and thundersnow- it was actually lightening and thundering during the snow storm. This clip from Weather.com caught the action of both the thunder and lightening, check it out- it's cool! So along with the snow was the horrendous wind that found it's way through our windows, under the doors and down the vents. It's been chilly in here. When I woke up this morning I put a little Baileys in my coffee to warm up. And then I thought how great a scone would be great with my coffee. Then I thought how great would it be if there was Baileys in my scone? With Kahlua and chocolate too??? Before I knew what hit me the the oven was on and my hands were in a bowl of flour. I like to use applesauce in scones to keep the fat down, but do apples and Baileys really go together? And do calories count during a blizzard? After a few modifications to one of my classic scone recipes, the scones were nestled in a toasty oven doing there thing. I'm just going to say it, sooo goood! Warm, moist, dense and fluffy all at the same time. The chocolate chips are needed to add depth to the Baileys and Kahlua so don't skip them. 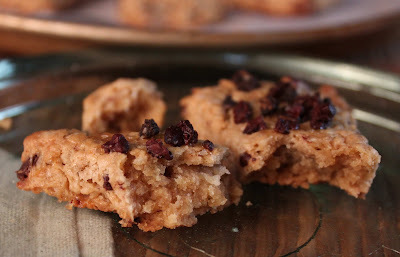 It's like a breakfast cookie, absolutely fabulous and a perfect start to a Fat and Happy snow day! Tips and Techniques: You can make these ahead of time, form them into shapes, lay flat on a cookie sheet and freeze. Once frozen, pile them into a freezer bag. When you are ready to bake, simply drop on a cookie sheet, brush with milk and bake. 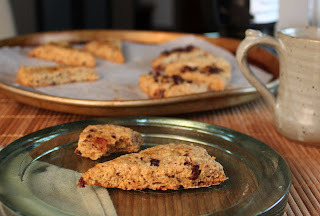 I added just a touch of protein to these scones by using cooked quinoa, you could easily substitute dry oatmeal instead but I would also add a few tablespoons of milk as well. Secret Ingredient: My friend Marianne brought me a secret ingredient a few weeks ago, as I thought about these scones this morning the first thing that came to mind was how that the crystallized honey would make a super topping in place of sugar. It gives a nice mild honey flavor that blends with the liquor. Thanks Marianne! Mix all the dry ingredients in a large bowl (flour, sugar, baking powder, salt and quinoa). In a smaller bowl mix the wet ingredients (Baileys, Kahlua, olive oil, egg yolk and vanilla). Cut the chilled butter into smaller pieces and add to the dry ingredients. Using your fingers, work the butter into the flour until the butter forms pea-sized pieces. Add in the wet ingredients and mix with a fork just to combine everything. Wrap the dough tightly in plastic wrap and place in the refrigerator for 1 hour. Bake at 375 degrees for about 16 minutes (depending on the size of your scones.) The scones will be nicely browned on the bottom and lightly browned on top. The are best enjoyed the same day.